Quentin is thunderstruck. Naturally, this is the last thing he wants to hear. He’s a soap opera character stuck in a storyline that refuses to turn over, like a car that’s been out in the snow too long. If he’s not sick, then he has to find somebody else to talk to, and they don’t have time to dress another set. “You must have made a mistake,” he says. “Well, mentally, you’re just fine,” Cyrus says, which sounds like they consulted a barometer. “You’re as well balanced as anyone I know.” This is not actually very reassuring. As Quentin is well aware, Cyrus’ social circle is composed entirely of knaves, ne’er-do-wells and high-strung lab techs. No, he doesn’t say that, but I wish he had. His actual answer is even less convincing. Now, on this show, obviously, that should be the least surprising thing that anyone has ever said. Quentin and Cyrus have discussed supernatural phenomena practically every time they’ve seen each other, including the night they decided to burn Quentin’s dead wife’s body because they were frightened of it. 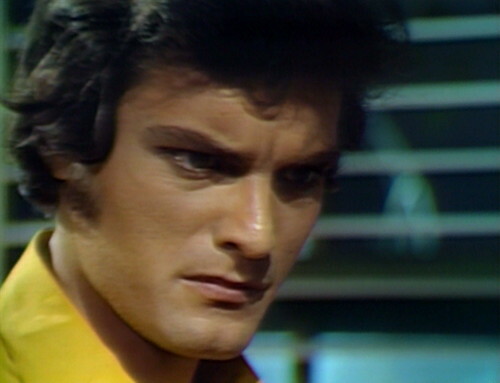 Another incredulous face from Quentin. He says, “Witchcraft?” as if he’s not talking to a character whose backstory explicitly includes a lifelong semi-academic interest in witchcraft, but I guess today we’re pretending that he’s a doctor. “There are any number of methods used to practice black magic,” Cyrus says, so here we go. Which is — wait, what? When were you in a village in Africa? “They use other methods, too!” Cyrus says, flashing back to his Peace Corps days. “Potions, other things, the casting of spells…” Of course, it’s the other things you really have to watch out for. Which is just silly. Both of these characters are acquainted with several people who play with black magic on a regular basis. Cyrus is one of them. Honestly, sometimes I wonder if these people even pay attention to what they’re saying. “It could be anyone!” Cyrus shrugs. “But there’s no point in speculating about who it is.” It’s called bedside manner. But I already have my clothes on, Quentin thinks. So what now? Tomorrow: Peer at a Prop. When Cyrus tells Quentin that he’s in perfect physical condition, somebody in the studio coughs. Although they’re in the hospital, so maybe that was just atmosphere. This is the first episode with the credit: “Miss Scott’s clothes courtesy of Junior Sophisticates”. I’d forgotten the show had gotten this dull and pointless. 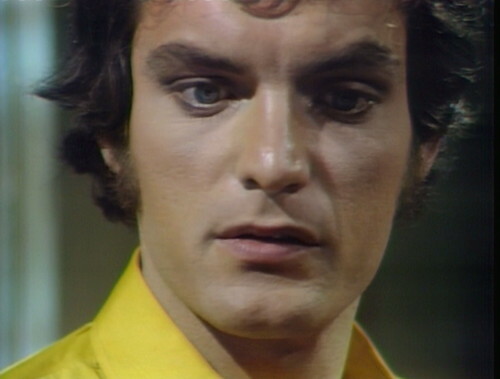 And Barnabas is even a vampire during it — it’s not even a Barnabas the Butler period. Did I miss the death notice of his re-joining Frid, Hall & Russell in the great beyond? I had thought writer Joe Caldwell was still here with us. I read an interview he gave 4 or 5 years ago. So I was hoping he is still alive. Anybody know? He is eighty-eight and living in New York City. Here’s the link (at bottom) to the Joe Caldwell interview article from 2013. A short, interesting read titled, “Original Dark Shadows Writer Joseph Caldwell Played It Straight” by Ryan Britt, March 21, 2013. 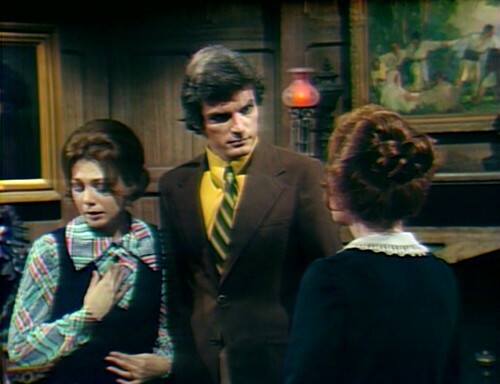 This is also the episode in which, Barnabas, frustrated in his attempt to bite Maggie, instead goes and listen to her troubles and decides to do something about them. He basically trades vampirism for the joys of being a busybody. OY! It’s Barnabas the yenta! If Cyrus were a physician (and PT Obamacare wasn’t repealed), then he would have been able to diagnose Selby’s appendicitis was ~200 episodes away. Well, Dr Longworth could have been in the Peace Corps and assigned to Africa. 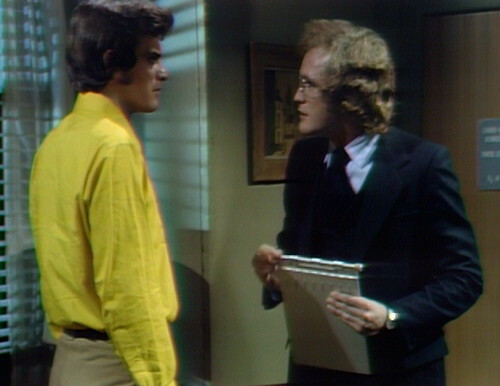 As for his medical expertise he probably went to the PT version of the mad scientist medical school where Dr Hoffman went. He’s a cardiologist/psychiatrist/mad scientist while Julia is a hemotologist/psychiatrist/mad scientist. Replying nearly a year later to say that I have a theory that Julia studied at Miskatonic University (under the late Professor Herbert West). Maybe Cyrus studied at Parallel Miskatonic University…? I’m just pondering what MY reaction would be if my doctor gave me Longworth’s explanation. Guessing I would at least ask for a second opinion…maybe put in a call to the AMA. And see if my health plan covers witchcraft. he had to run a test! One of my doctors once shrugged and said, “I don’t know; maybe you’ve been abducted by aliens,” when I told him about some strange new symptoms. And when I got to the pharmacy, I noticed he had put religious tracts in with my prescriptions. So I guess you can get a medical degree at The Institute of Mad Science. And last (I swear I’ll drop this now) how is it that Dr. Longworth is suddenly working at the hospital? Are they AT a hospital, or is this just Dr. Woodard’s abandoned office? No, wait…Woodard would still be alive in PT; and so would (EEEEEEE!) Dr. Lang! Collinsport Hospital: You Don’t Have to Be a Mad Doctor to Treat Patients Here, But It Helps! 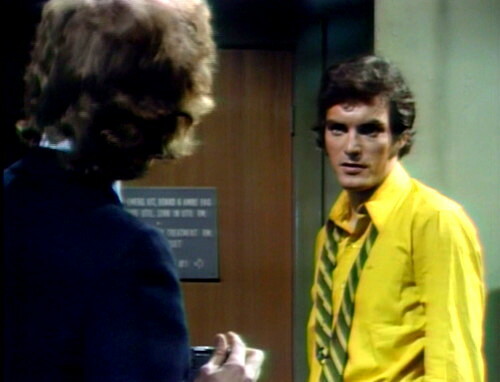 Perhaps PT Woodard went to school with Hoffman, and now is the chauffeur at Collinwood? Eric Lang works as a butcher at the Collinsport A&P. Something something Butcher Lang best known for his ham . . .
Where was that haunted hospital that Steven King did a TV show about? I think it was in Maine too. I worked in a real hospital in RI that goes back to the civil war era, and owing to the several suicides that happened when I worked there of both patients and staff members (a doctor took a header off a tenth floor roof, a nurse jumped out a window after been diagnosed with breast cancer, a patient jumped out of an eighth floor window and landed on a second floor ledge, several collegues of mine heard the thud) I would have to say it was/is haunted. Plus, I could sense all the negative energy in there, I’ve had the same thing happen to me in old houses where violent deaths were known to have occurred. I owned a rental house like that for a time, then sold it. I got physically ill when I was trying to work on it. I worked in the hospital for four years and felt depressed the whole time. I went back to visit a friend who was a patient there several years later and felt the same way. I don’t think the supernatural is all fiction, due to my experiences. Some of it, at least, is real. Well, even if Cyrus’ medical instincts ruled out calling an ambulance for Quentin, he should at least have ordered an emergency séance. Perhaps a holy water enema. My apologies to Mr. Russell for assuming he had shuffled off this mortal coil. Gordon Russell passed in 1981. It’s Joe Caldwell who is still with us. I wish there were a “like” button on this blog’s commenting threads. 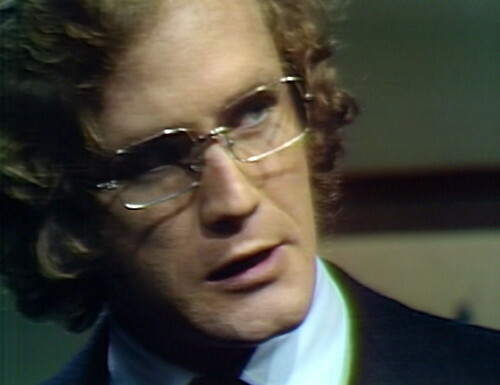 I would love to hear Dr. Longworth testify about black magicks during Quentin’s eventual Social Security Disability hearing (because you know he’s totally filing for heart disease after getting out of Collinsport General). Cyrus, you might be able to fool the less-sophisticated 11-year-old soap opera viewer back in 1970, but, sir, you’d never be able to put that line of baloney over on Uncle Sam. 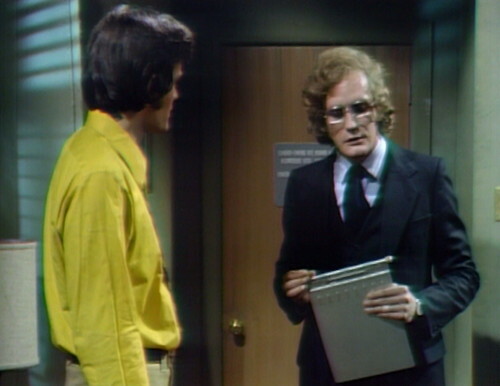 Quentin would be needin’ some black magic to keep the lights on at Collinwood witha Social Security disability check. He’d need government subsidies all up in that mansion or else Elizabeth and Roger would have to go get actual jobs. 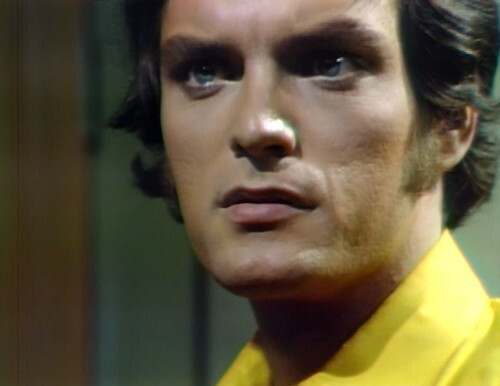 John E., wouldn’t we LOVE to stay at the Collinwood B&B?! You could guard our bedroom door all night with your silver handled cane and I could guard the window all night with a crucifix and we could enjoy one of Mrs. Johnson’s “boiled” breakfasts in the morning – if we live that long! Then we could go spent the nixt night at the Amityville House B&B. Okay! I’ll bring the sunscreen and you bring the rope and tennis balls! I think we should skip the Georgetown B&B though – I hear those concrete steps out back can be kinda tricky. No arguments there. That whole Washington DC area needs an exorcism, and not in a good way either! 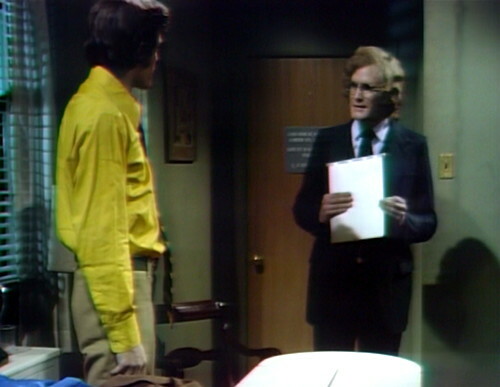 The first pic in today’s blog makes DS fit right in with the ABC afternoon line-up in 1970: General Hospital, and One Life to Live ( which had lots of hospital scenes). 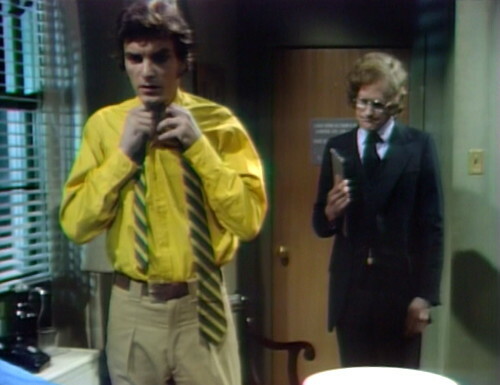 Quentin’s ailment is a direct result of that shirt.